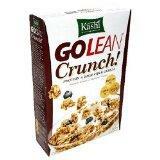 Go Lean Crunch is a healthy cereal choice. If you believe all the commercials out there, just about every cereal you can buy claims to be one of the healthiest breakfast cereals to meet your nutritional daily requirements. With all the claims of "good-for-you" cereals, choosing the healthiest breakfast cereals for your diet takes a bit of work. The cereal aisle is a long one filled with brightly colored boxes designed to grab your attention. Slogans and other advertising promise whole grain, bran, low sugar, and sweetened with honey, but does that mean they are healthy for you and your family? The best place to start your quest for the healthiest cereals is to read the ingredients listed on the individual cereal boxes. Ingredients are listed in order of predominance. In other words, ingredients used in the greatest amount will be listed first. This comes in handy if you are trying to limit your intake of certain foods such as sugar. If you're looking for a cereal that is low in sugar, avoid buying a product that lists sugar in the first three ingredients. Honey Nut Cheerios' ingredients include: "whole grain oats (includes the oat bran), sugar, oat bran, modified corn starch, honey, brown sugar syrup, salt, ground almonds […]". Not only is sugar the second highest ingredient, but two more forms of sugar are listed. On the other hand if you find refined or enriched grains listed in the first three ingredients on the list, then it will not meet your criteria for a healthy cereal. One thing that makes these easy to identify is the word white. For example, white rice or white flour are processed and no longer a whole food. Enriched is another clue, because the manufacturer has tried to put back the nutrients that were stripped in the refining process. The healthiest choice is to just eat the whole grain product. Great progress has been made in removing trans fats from most cereals. General Mills, Quaker, and Post cereals no longer contain trans fats. Following their example, Kelloggs is also moving in this direction with their healthful cereals. However, it still pays to read the label because products that have less that .5 grams of trans fat can claim zero trans fats. Search the ingredients for things like partially hydrogenated oil and shortening. If you find them listed in the ingredients, that means the cereal contains trans fats and isn't your healthiest choice. Now that you know to look for the ingredients list on your cereal boxes the following lists will prove helpful in choosing the right cereal for your diet. However, even if the cereal is listed here, read the ingredients on the box. Manufacturers can change their ingredients at any time. These are cereals made by the major brands, but other healthy cereals made by smaller brands can be found on the store shelves. While all of these cereals are healthy choices, if you are following a calorie restricted diet, some of the cereals listed here will blow your diet out of the water first thing in the morning. For example, one cup of Oatmeal Crisp is 220 calories. By the time you add some fruit and milk that may be too many calories for someone on a 1200 calorie diet plan. If that is the case for you, when you read the label, you'll also need to check serving sizes and calories per serving.